Memorials in front of Robert Green’s home. Photos by Nik Nerburn. George W. Bush at Warren Easton High School in New Orleans. The only thing between George W. Bush and me was a volleyball net. On his side were bleachers packed with students cherry-picked for a photo op at Warren Easton High School in New Orleans. On my side was the press. We were a fairly small bunch of mostly local reporters. When I arrived at 8:15 that morning, school staff were shuttling neatly uniformed teenagers onto buses, clearing out the building for the former president's arrival. A group of bus drivers stood around talking while they waited for the students to board. “I can’t believe he’s going to show his face here,” one of them said. A lone protester on the sidewalk held a sign that summed up the reason for the driver’s sentiment. You’re early, it read. Come back in a week. The words were printed on a photograph of Bush peering out the window of Air Force One, taken as he flew over New Orleans on his way back to Washington from a vacation at his Texas ranch. It was taken two days after Katrina made landfall in the city. At that point, people were stranded on rooftops, dying in the Superdome, wading out of New Orleans only to be turned back by armed vigilantes from neighboring parishes. In the coming days, Bush would tour other areas of the Gulf Coast, but he wouldn’t set foot on New Orleans soil until September 11, nearly two weeks after the city flooded. Now he was back one day before the 10th anniversary of the storm, set to give a speech at Warren Easton. When I checked in at the event’s media table, the press coordinator gave me marching orders: Report to the auditorium and wait. There will be two opportunities to photograph Mr. Bush while he’s on a tour of the school before he makes remarks. No questions. Do not try to engage with him. During the last week of August 2015, the number of people in New Orleans swelled. Journalists, celebrities, elected officials, and presidents current and past descended upon the city for a carefully vetted jamboree of commemorative events leading up to the 10th anniversary of Hurricane Katrina. There were panel discussions featuring famous philanthropists and bank CEOs at the Sheraton and Hyatt hotels, boat and airplane tours of the city’s new surge barrier (dubbed “The Great Wall of New Orleans”), a Wal-Mart sponsored Day of Service, the launch of a Rockefeller Foundation-funded “Resilience Strategy,” and a massive celebration at the Smoothie King Center featuring Grammy-award-winning musicians, CNN reporter Soledad O’Brien, and former President Bill Clinton. During the storm, Warren Easton, New Orleans’ oldest public high school, was pummeled by wind and flooded with five feet of water. In the aftermath, the city had planned to redevelop the school into condos rather than to reopen its doors. But a group of alumni rallied to save Warren Easton and, as the city’s highest performing school before the storm, it became a poster child of the recovery effort, garnering celebrity support from the likes of Sandra Bullock and Duran Duran. Former First Lady Laura Bush’s library foundation awarded the school a grant for books, a gesture that apparently warranted a celebratory visit from her husband on the first anniversary of the storm and again, 10 years later. Now, in the gym, the students on the bleachers looked nonplussed until cameras compelled them to smile. The former president sat among them and chatted briefly before his handlers whisked him away for a shot with the volleyball team. “What did he say to you?” I asked a boy whom Bush had stiffly clapped on one shoulder. “He asked if this was my girlfriend,” he replied, gesturing toward the girl seated next to him. I asked the girl how she felt about Bush’s presence. Bush got up. He joked about his dad skydiving. He quipped about sitting on “one of those big ships” in the aftermath of the storm with General Honoré, who was drinking at the time. He spoke very seriously about education reform and the “soft bigotry of low expectations.” And somewhere in the middle of all the anecdotes, Bush addressed the storm and the much-criticized recovery efforts head on. But most New Orleanians don’t remember what Bush remembers. They remember more, and they remember different. Outside, on the sidewalk in front of Warren Easton, three women had gathered. They were members of Southerners on New Ground, a group that organizes queer people in communities across the South and that has been active in the Black Lives Matter Movement. A student appeared in the window of a ground-floor classroom, crouched a bit to see and be seen through the blinds. He raised his fist. The SONG women saw, locked eyes with him, and raised their fists as they continued to chant. During the last week of August, from the Smoothie King Center to Congo Square, the city of New Orleans was not so much a site of commemoration as of contestation. A cacophony of voices asserted not only what we should remember, but what those memories mean for where we go from here. In city-organized panel discussions held in hotel convention halls, philanthropists, bureaucrats, and bankers rattled off talking points fueled by the city’s “recovery data.” There are 600 more restaurants now than there were in 2005. Police have body cameras. Forbes Magazine named New Orleans the nation’s “#1 Biggest Brain Magnet.” Yet away from the glitz, nearly every Katrina survivor I spoke with told stories that made visceral how incarceration, education inequality, economic disparity, and racism still shape the city — issues that the panelists only tiptoed around. Those issues were central to a very different sort of convention from the ones held in hotels downtown. Under the live oaks of Louis Armstrong Park, four hundred people from across the American South (plus “up-South” Detroit, and global south Puerto Rico) gathered in tents to discuss the problems they face in their communities and to strategize on building a Southern Freedom Movement. This was the fifth annual Southern Movement Assembly. "When Hurricane Katrina hit and the government authorities left people to die, what became clear to many of us was that regardless of what the existing power structure was doing, we needed to have a parallel system that can respond. And for us that's social movement," said Emery Wright, co-director of Project South, one of fourteen anchor organizations that planned the assembly. Chief Thomas DarDar of the United Houma Nation began the event with song, prayer, smudging, and a message from his community — an indigenous nation of 17,000 people who are at risk of disbanding as they lose land to coastal subsidence. He spoke about Isle de Jean Charles where, before Katrina, 500 people supported themselves, mostly by hunting and fishing. Now fewer than 25 families remain. The convergence was hosted by Gulf South Rising, a collective of grassroots leaders from across the Gulf Coast that organized a week of action to refashion the dominant theme of Resilience to one of Resistance. 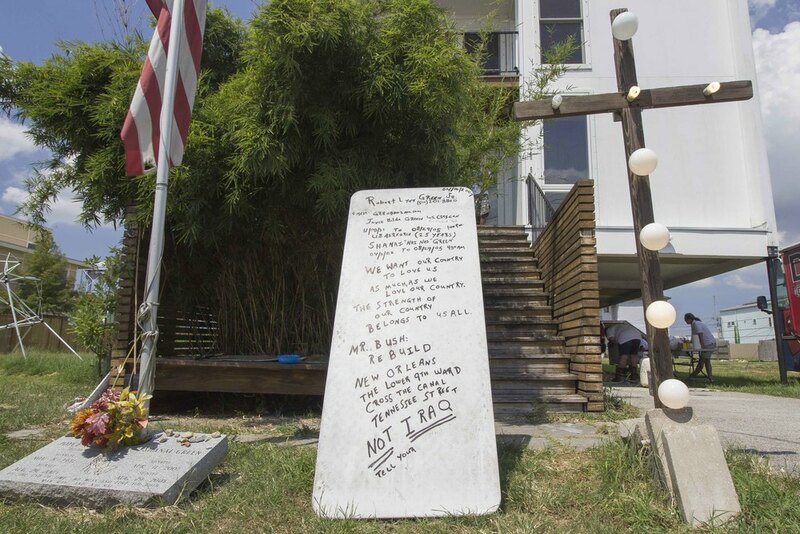 Public speeches and private memorials expressed different, often times contradictory, narratives of what Katrina did to the city and what the storm continues to mean to this day. Robert Green, president of the Historic Lower Ninth Ward Neighborhood Association, rendered a chronology of his Katrina experience on a set of four mugs that he sells. I saw them displayed on a table in his front yard. It was Aug. 29, ten years after the Industrial Canal levee breached, sending water pouring into his neighborhood. The first mug was a sketch of a man standing on the roof of a submerged house. “Original Roof Riders,” it said in red letters. This mug commemorated how Green’s mother’s house filled with water during the storm surge. Green was there with her, his brother, a mentally disabled cousin, and his three very young granddaughters. They had tried to evacuate the city a day earlier, but turned back when gridlock traffic prevented their escape. Around 4 a.m. on Aug. 29, the floodwaters came. The house filled so quickly they gave up on the possibility of getting to higher ground. They resolved to go to the attic. The brothers lifted their wheelchair-bound mother, disabled cousin and the three little girls through the hatch. The family wasn’t safe for long. The flood swept the house off its foundation. They were adrift and sinking as the water rose. Green’s brother punched the ceiling until it gave way. He tore a hole big enough to climb through, and they got everyone to the roof. The house floated two blocks, then bumped up against another house. Green hoisted three-year-old Shanai onto the roof of the stable house. When he turned to grab her sister, Shanai slid off and disappeared into the dark waters. Green couldn’t swim. The water was turbulent. Everyone was in danger. He kept going. The family spent the night in the driving rain on their neighbor’s roof. When the sun came up, Green’s ailing mother, Joyce, had died. Before she went, she told him she would take care of Shanai. Their names are on a stone plaque in Green’s yard. The second mug featured a 2007 photo of Green. He’s standing by his mother’s doorsteps, draped in an American flag with his arms spread, turning the flag into a set of wings. After the storm, Road Home, a state program that distributed federal funds to individuals for rebuilding, sent an adjuster to the property. Green said he was told the cost to rebuild would be $167,000. He said Road Home offered him a grant for $700. Green filed a claim with FEMA. He didn’t hear anything for a long time. He called to inquire about his claim. A FEMA agent told him that his mother had called and rescinded the claim. The third mug, in turn, has a photo of Green with Brad Pitt on it. The scene is from 2008, when Pitt’s Make It Right program began replacing destroyed homes with the brightly painted, LEED-certified houses that are widespread in parts of the Lower Ninth Ward today. Widespread, but not everywhere. Three people told me their properties fell outside of Pitt’s parameters; one said his house was on the eighteen hundred block of a street where Make It Right stopped at seventeen hundred. Only one of the three had managed to rebuild on their own. Unfortunately, Green’s story is not unique. Nearly all the storm survivors I spoke to had a saga to tell about the tribulations of returning home. Robert Chenau, who is still rebuilding his house 10 years later, lives 700 miles away in Norman, Oklahoma. “They give you a molehill and expect you to build a mountain,” he said of the Road Home program. Eloise Williams, who weathered Katrina in her Lower Algiers home only to be forced out days later by police who had orders to evacuate the area. She said that when she returned and applied for a grant from Road Home, she was told that because a city program had already awarded her funding, she would receive a reduced grant. The only problem was that she had never received a check from the city as they claimed. “The money went to the biggie-biggies. The little people didn’t get anything,” Williams said. Robert Green, friends, and family in a Second Line. When the floodwater receded and the utilities were back up and running, Derek’s family wasn’t allowed to return to B.W. Cooper, which suffered negligible storm damage––not even to retrieve their unscathed possessions. The city council unanimously voted to demolish the complex along with three others and redevelop them into mixed income housing. Robert Green’s fourth and final coffee mug shows his new house on the lot where his mother’s home once stood. It’s a Brad Pitt house. Angular and white, it is raised high off the ground with thirteen steps leading to the front porch. Underneath, there is room for water to rise should it ever come again, or to park a car, or to boil sausage and seafood for dozens of neighbors, as Green was doing on the day we met. By 2 p.m., Second Line musicians had assembled on the corner of Tennessee and Prieur and members of the Original Big Nine Social Aid and Pleasure Club were ready in their white linen finery, with feather-bedecked fans and umbrellas. As the brass band began to play “Feel Like Funkin’ It Up,” members of the Big Nine strutted and stepped down Tennessee Street. On their sleeves were armbands that read, Joyce Green - Shanai Green - Never Forgotten. I want to talk about what the storm left in its wake. I want to talk about what it means to try to repair the irreparable, about how sometimes a place is never the same and how pretending it is creates an act of incessant denial, an erasure of what was lost and what could have been.